Email marketing is a hallmark for any modern business. But often brands don’t utilize the stalwart channel to its greatest effect. 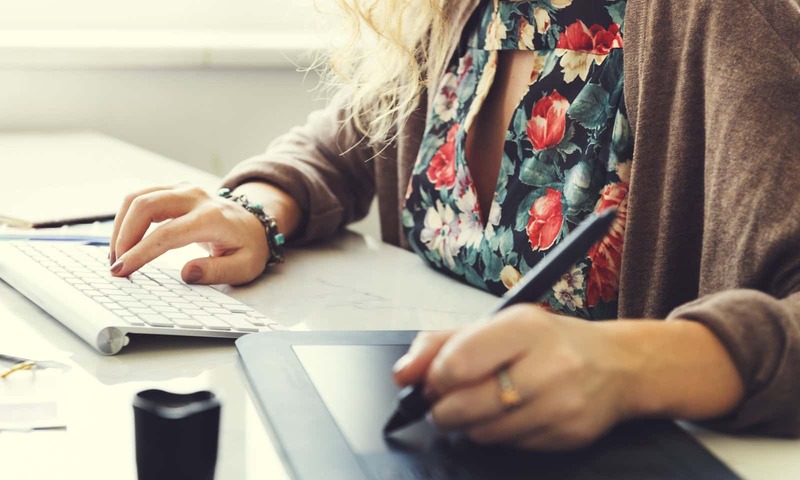 In this article from Chui Chui Tan, she presents many great guidelines and examples on email design — an important aspect of your overall program. In order to make the most of your email results, you need to be thinking beyond just design. Learn more about Sailthru’s email marketing services here to see how we send better email. The fundamental rule for creating an email newsletter is to give it interesting, relevant and up-to-date information that is enjoyable to read. Users sign up for newsletters hoping be informed about things that they would not otherwise be able to find out about. 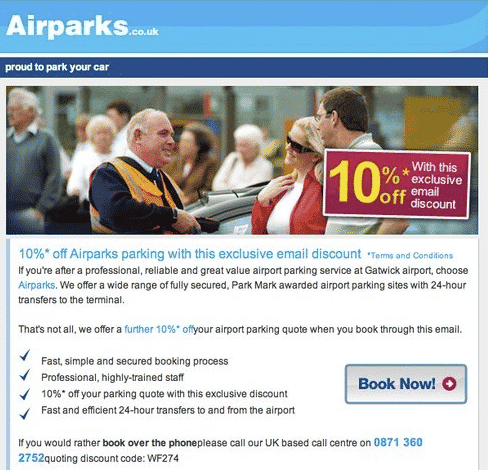 In this article, we’ll discuss some guidelines for designing and distributing email newsletters. Each point will be accompanied by both good and bad examples. Please notice: in this post we features both good and bad examples of newsletter design, so you can get a better understanding of the problems to avoid and good design decisions to make. On the Mulberry sign-up page, the company promises to send users exclusive updates and offers. The Marie Claire UK subscription page clearly states that its newsletters include news, beauty buys, competitions and offers. You may want to consider giving some reward to users for signing up; for example, a free gift, voucher or discount. To encourage users to sign up for his newsletter, Jamie Oliver offers a free £25 wine voucher that can be claimed after subscribing (on the condition that users spend £64.99 or more on the wine). If you will give rewards, let users know as soon as possible in the process. 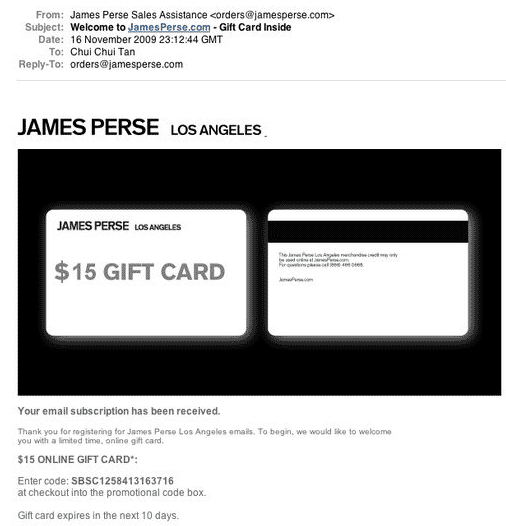 James Perse gives users who subscribe to its newsletter a $15 online gift card. However, the reward is not mentioned on the subscription page, and the promotion code is sent via a confirmation email only after the subscription has been received. You would not have known that until you subscribed. The company is clearly missing a great opportunity to get people to sign up for its newsletters. One way to let users know what they will get is to give them a preview of your newsletter. 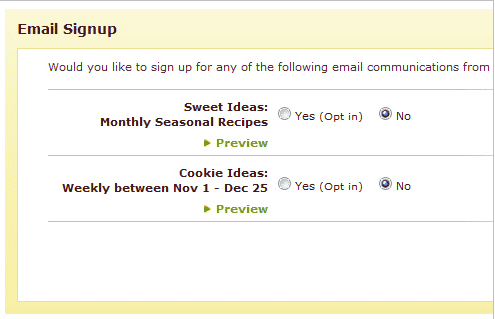 Hershey’s Kitchens has two different newsletters, and it offers examples of both types. The company even gives each newsletter a name and clearly indicates how often it will be sent out. 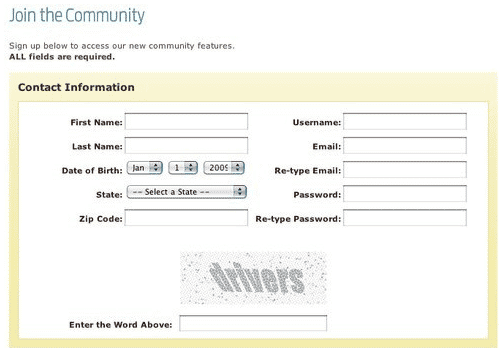 Users avoid filling out forms and submitting their details if possible. For a newsletter sign-ups, all you need is their email address. Hersey’s Kitchens has 10 mandatory fields. MarieClaire.com has 8 fields, but only the email field is required. We have found from our studies, though, that people often miss the asterisk or do not know what it means. Users who are reluctant to fill in many details may well refuse to sign up in this case. The sender, to see if it is from someone they know. The subject line, to see if it is of interest to them. The date, to see if the communication is up to date. One way to encourage users to open your newsletter is to write a subject line that grabs their attention. If you are offering some sort of deal in your newsletter, try to avoid generic appeals in your subject line (for instance, Game July newsletter subject line: “Sizzling Summer Deals”). Instead, mention specific offers, such as Dorothy Perkins November Issue: “25% Off Just for You”. Also, be realistic about your offers, and avoid making them sound too good to be true. Users are skeptical about subject lines like “Get 1000 Extra Points” because they know they will often have to spend a lot to get those points. A newsletter should contain information that users would not normally research on their own. Users take seconds to scan for topics of interest to them before deciding whether to spend more time reading the newsletter. 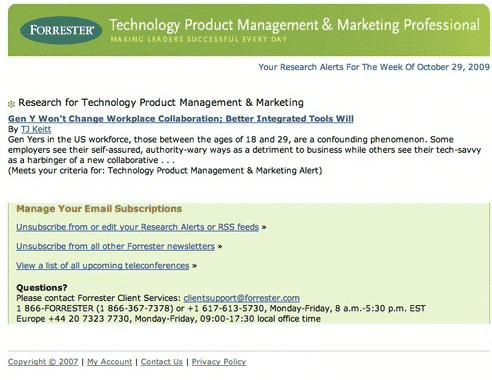 If your newsletter, like Forrester‘s, shows only one or two topics, users would less likely to find something of interest to them. Furthermore, including links to your website in the newsletter is crucial. Asking users for more (optional) information when they sign up. 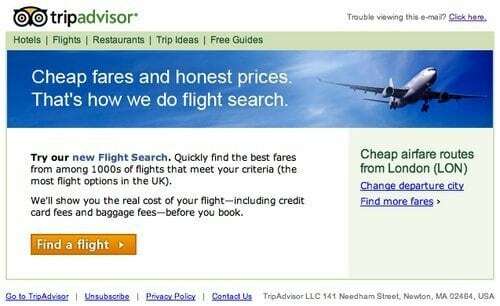 Implicitly recording what they buy and view on your website. 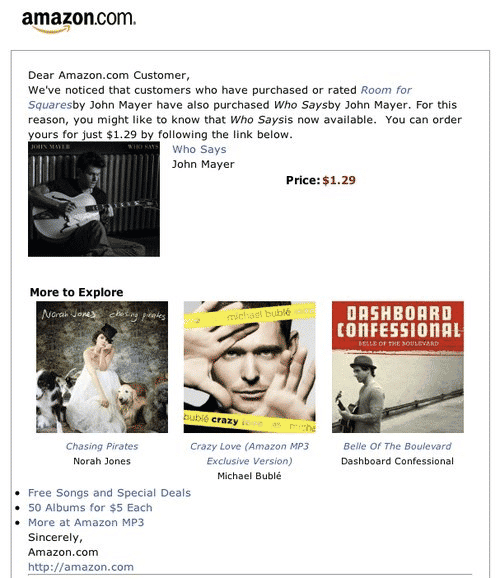 For example, Amazon sends newsletter with recommendations based on what its users have purchased. 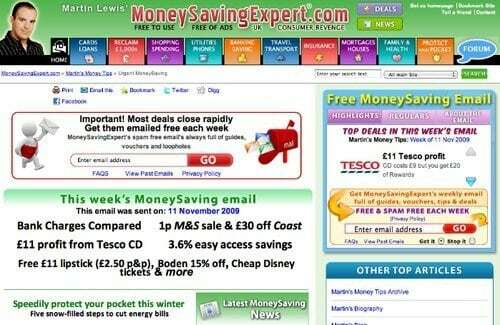 Recommendation-based newsletters can be highly useful, provided that your analytics are accurate. You could always offer subscribers special deals or freebies. There are a few ways to go about this. 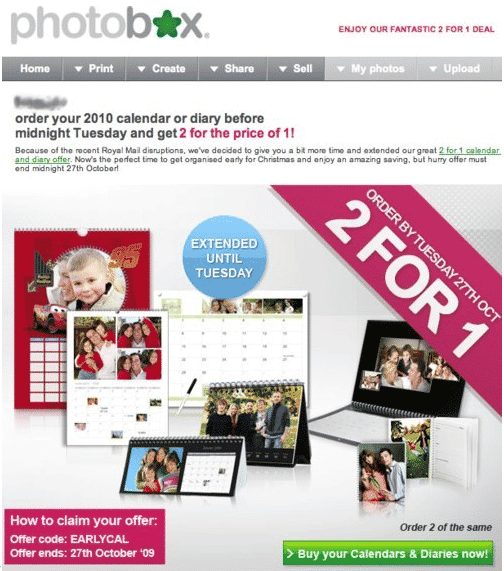 H&M and Photobox ask users to present their newsletters at the point of purchase in stores to receive discounts. Clinique and Airparks include a promotion code in their newsletters that users can redeem when checking out online. Avoid putting these benefits so deep in the newsletter that users miss them. For instance, Clinique (above) puts its code at the bottom of the page, whereas Airparks puts its at the very top of the page. In addition, make sure the rewards are relevant to your product and target audience. 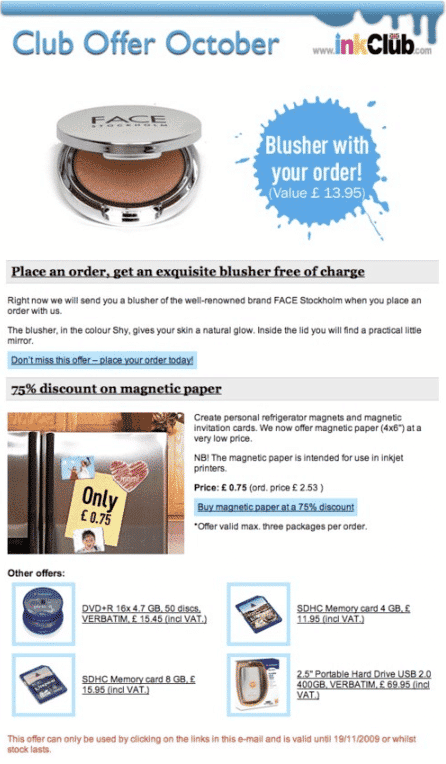 Take Inkclub, which gives out a free blusher to customers who shop via its newsletter. Not only does this item have little relevance to Inkclub’s product line, but it may not be very attractive to the company’s target users. 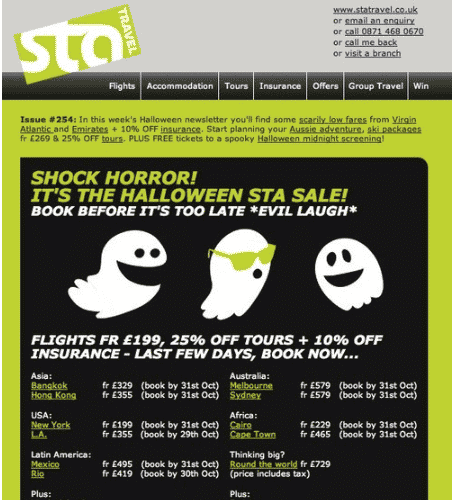 Design your newsletter to suit its chief purpose. If the main objective is to announce a new product or promote a particular service, you may want to focus the newsletter entirely on this product or service. 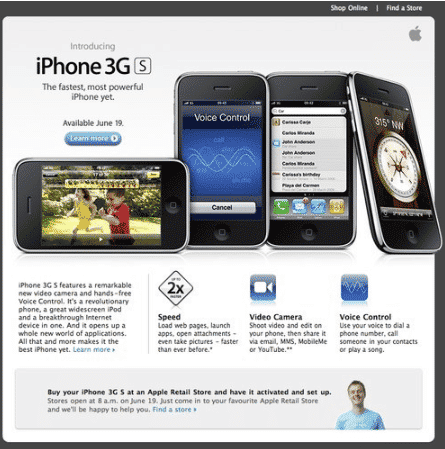 Good examples are Apple in promoting its iPhone 3GS. 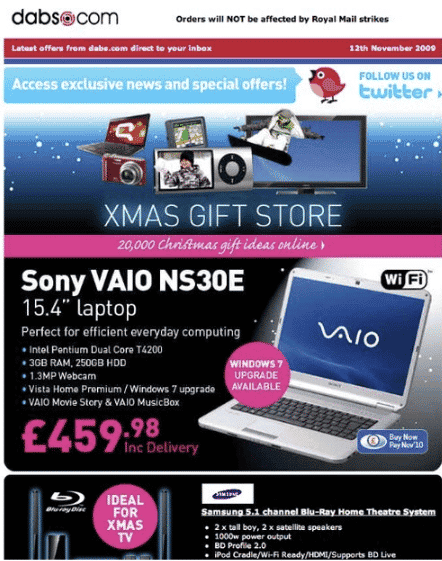 Apple newsletter promoting its iPhone 3GS. 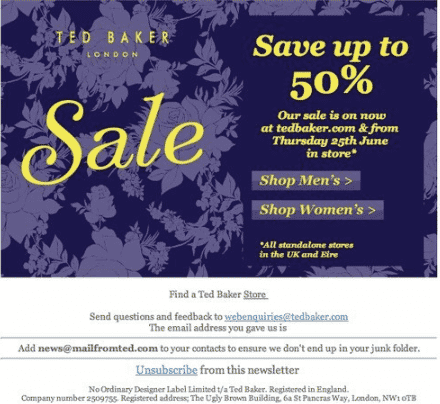 To promote its latest exclusive offers, Ted Baker takes an easy and rather lazy approach: the whole newsletter consists merely of one big banner showing offers of 50% off, in the hope that users will click to the website to find out more. By contrast, Dabs.com showcases a number of its latest deals in its newsletter, giving users a rough idea of its product line and sale prices. You could also adopt a catalogue style, like IKEA, or create a summary of your e-commerce website, like Audible, which teases users to visit its website with prices and a clear call-to-action button. As reported by the Nielsen Norman Group in its Email Newsletter Usability Report, the average reader skims a newsletter for 51 seconds. People never read: they scan for content that is of interest to them. So, don’t overwhelm them by squeezing too much information on the page. Make sure your content gets straight to the point, and write short paragraphs and bullet points. 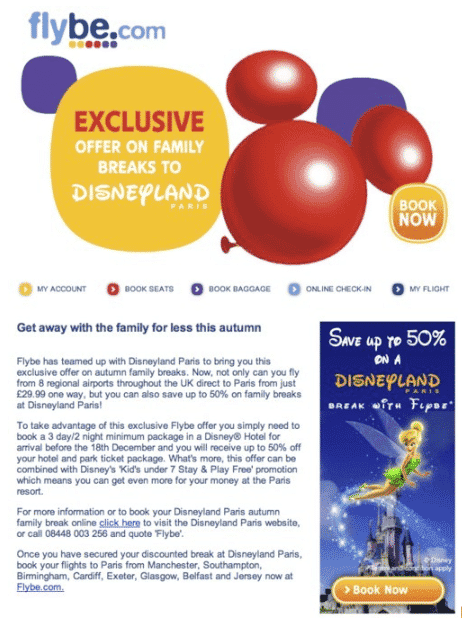 The main purpose of Flybe’s newsletter is to present an exclusive offer on family trips to Disneyland. The value of this deal is lost among the long paragraphs. The message could be conveyed more effectively in bullet points for quick scanning. Users are drawn first to elements that are visually simulating, such as graphics. Use images to guide users to the most important content and messages. Numbers also grab attention. Users tend to associate them with prices and savings. Use percentages and dollar values to show concrete offers. 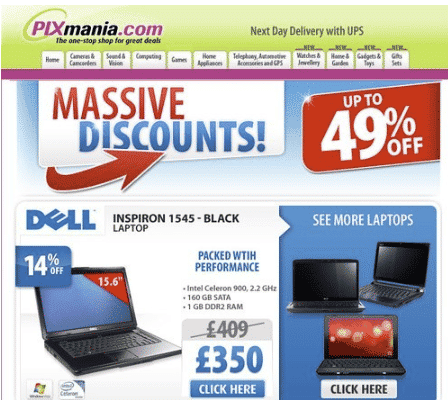 For example, Pixmanianewsletter has a big “49% off,” showing how much savings are available: clear and appealing. Color adds interest, too. But be careful, because inappropriate use makes for a messy, confusing newsletter. 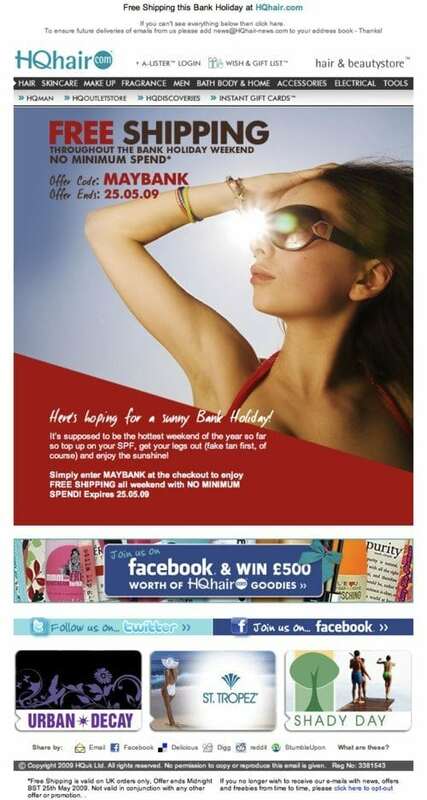 Take Rimmel London’s newsletter. A newsletter can be designed in a one-column or multi-column layout or a mixture of both. A one-column grid is easier to skim but might take up more space and increase the length of the newsletter. While people do skim email newsletters, that’s no reason to make them overly lengthy. 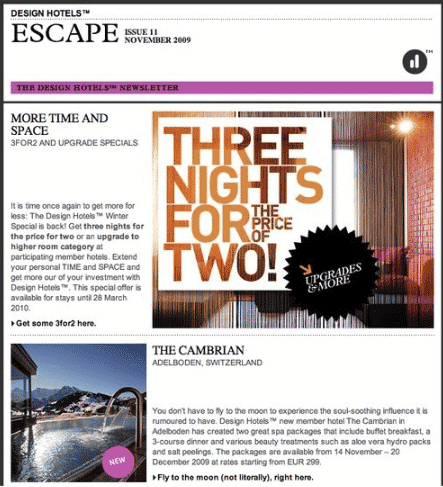 However, some exceptions are the Design Hotels newsletter, which is long but well organized. Hotels are shown based on location, with attractive photos and deals. 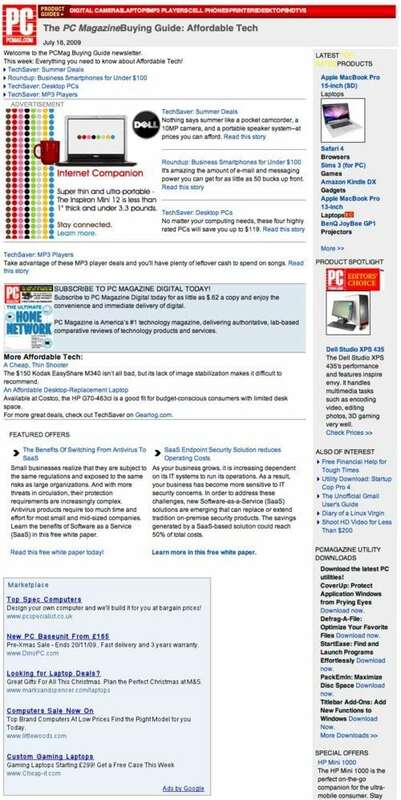 A two-column layout is common for newsletters. Narrower columns is usually used for the table of contents and upcoming events, while the main content is given a wider column. 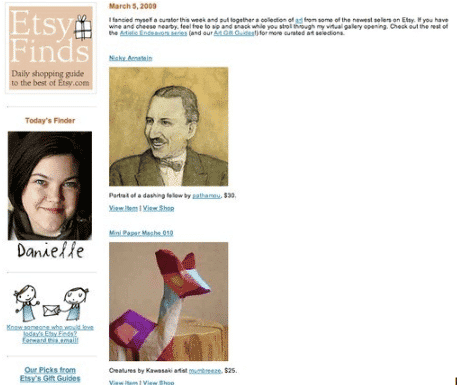 Etsy uses a two-column design for its newsletter, but both columns contain photos and links, and the sections have no prominent divisions. The design makes the page look messy and it lacks focus, making it hard to figure out where to look on the page. By contrast, iStockphoto‘s clear division between sections and grid design help guide the user’s attention to the left or right column. Creativity in a newsletter is always welcome. 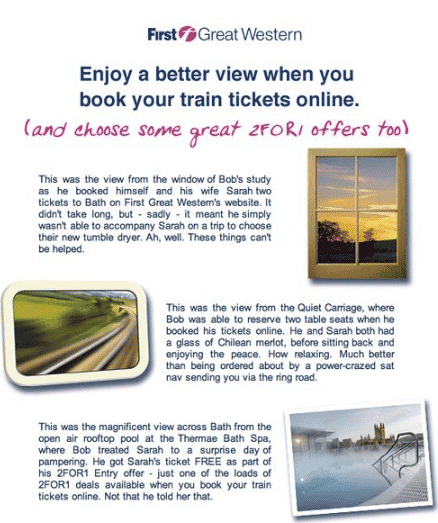 Both First Great Western and Southernpresent their content using fictional characters, Bob and Loco respectively, who users can easily relate to. Giving each edition of your newsletter a different layout or design is okay as long users can easily recognize your brand. 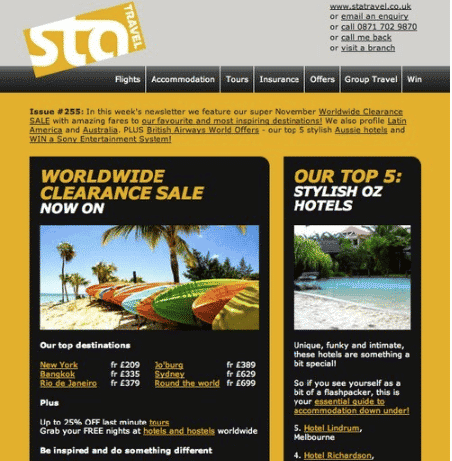 Despite STA Travel using various styles for its weekly newsletter, certain elements follow their branding guidelines, allowing users to quickly identify it. Unlike the rather uninspiring Tripadvisor newsletter, Top Gear gets creative with its hand-sketched design, which makes the newsletter fun to read and explore. Some newsletters include a table of contents at the top of the page, which can help users quickly scan for items of interest. A table of contents can be especially helpful in lengthy newsletters that have a lot of content, such as the one from MoneySavingExpert. Previous experience tells us, though, that some users do not understand that the links in the table of contents navigate within the newsletter. Assuming that the links take them to a website, they avoid clicking them altogether. 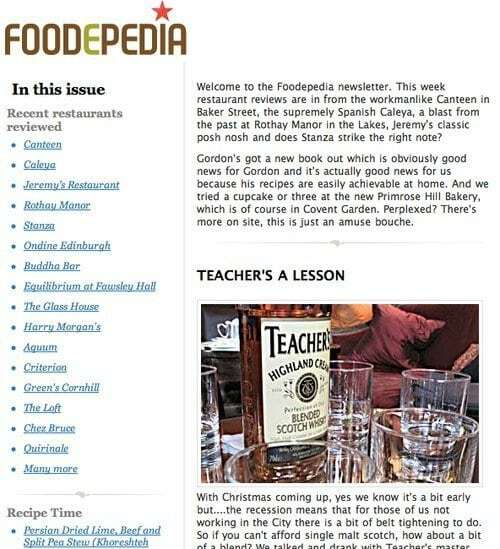 One solution is to avoid placing the links in the left or right columns, as Foodepedia does, which is where external links and ads are often found. If you have to include ads in your newsletter, make sure they blend in with the content. 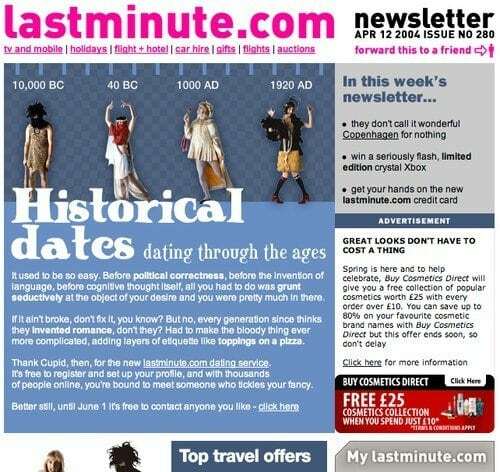 A good example of this is Lastminute.com, and a bad example is PCMag.com which merely copies Google AdSense code directly into its newsletter, making the page look messy and the content unconvincing. After sending out your newsletter, use an email marketing tool and list manager to track, monitor and measure the performance of your campaigns. 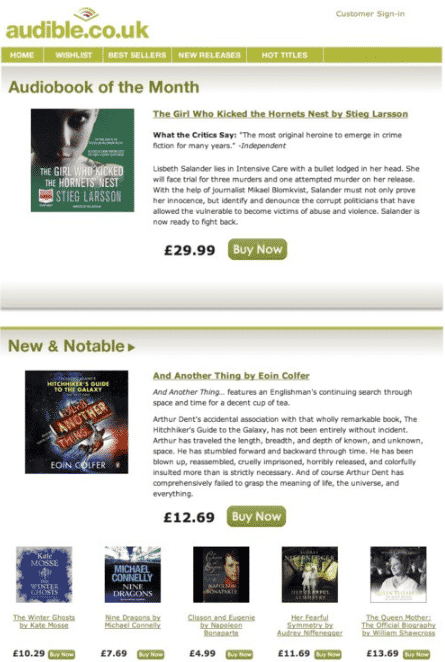 MacHeist‘s Directorate newsletter grabs its readers’ attention with the price of its iPhone apps (£0.99). Then, it tells them what MacHeist does in a short paragraph and presents its features in a clear and appealing way via icons. Simple, interesting and effective. Headscape‘s newsletter with large headlines and nice illustrations. 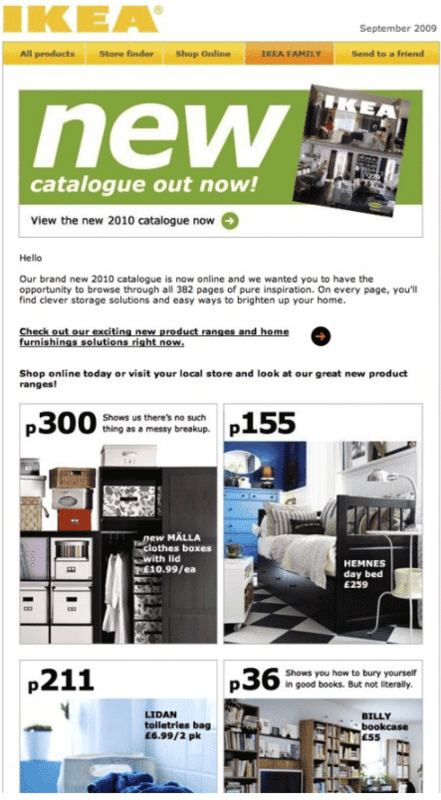 Muji‘s newsletter has a tidy layout that allows for quick scanning. Each section is accompanied by nice product images and prices. 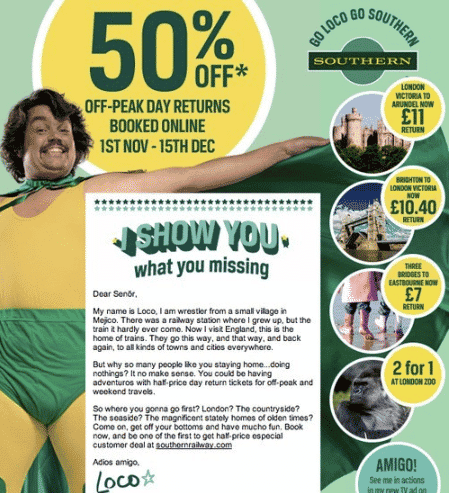 Howies might have a bit too much text in its newsletter. However, it organizes the content into different sections with big clear headings. 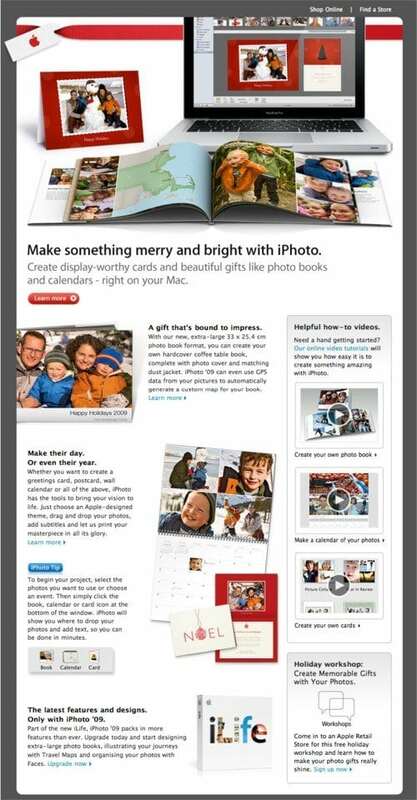 Apple‘s Christmas newsletter has a photo-related theme promoting its digital photo organizer software, iPhoto, and its photo books and calendar printing service. HQhair.com gives its users an exclusive offer with a code. It not only emphasizes the word “FREE” but makes good use of the model to draw attention to the offer. 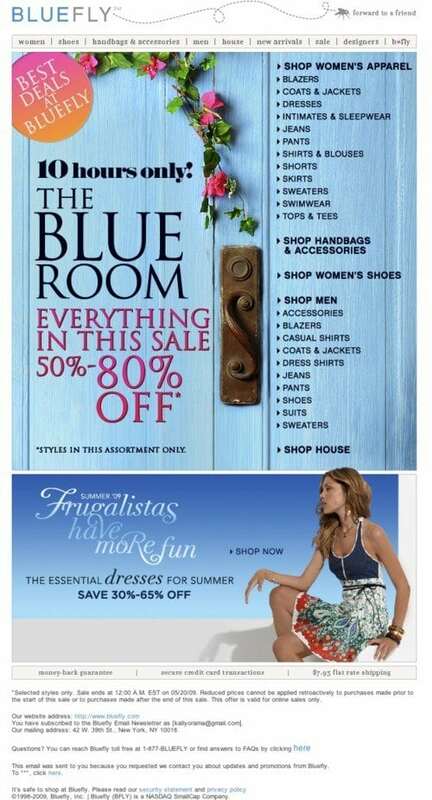 Bluefly cleverly divides its newsletter into two sections: “Offers” (the main section) and the right navigation section, using beautiful imagery in the process. Also, notice how it emphasizes the 80% offer and word “OFF” (in large font). 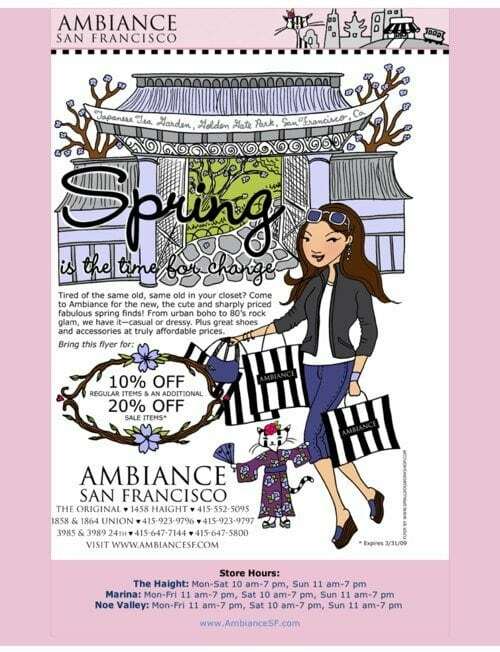 Ambiance San Francisco takes a creative drawing-based approach to encourage users to shop with it. 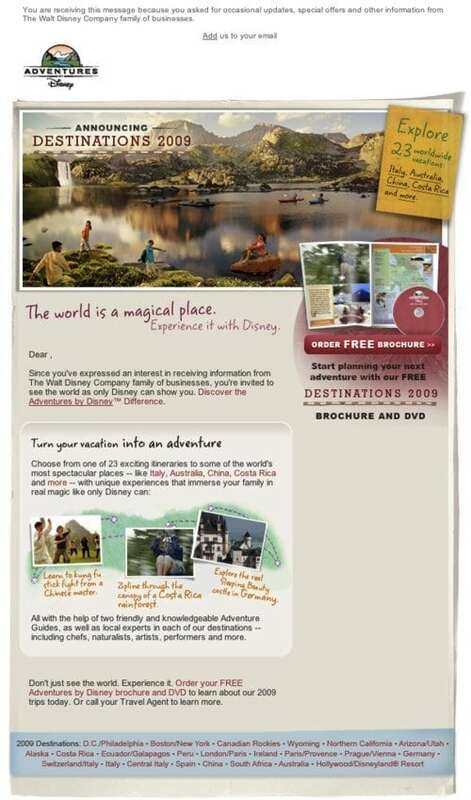 Disney Adventures‘ newsletter is another good example. Its beautiful picture gives users that holiday feeling. 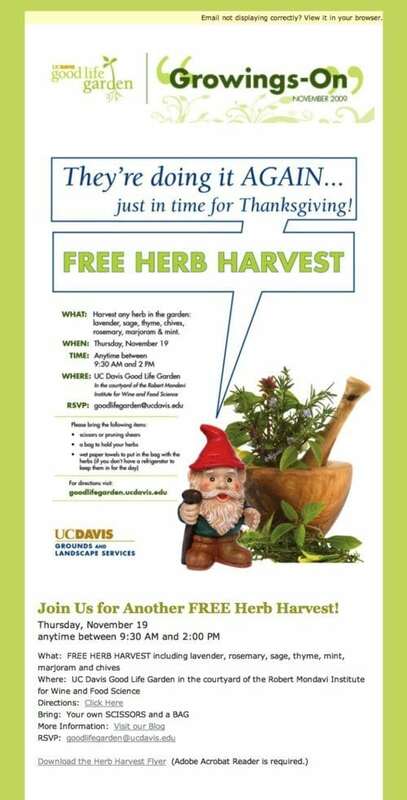 Good Life Garden‘s newsletter effectively uses the word “Free” to grab the user’s attention. The design is simple yet visually pleasing. Unfortunately, the content is repeated in the same newsletter. 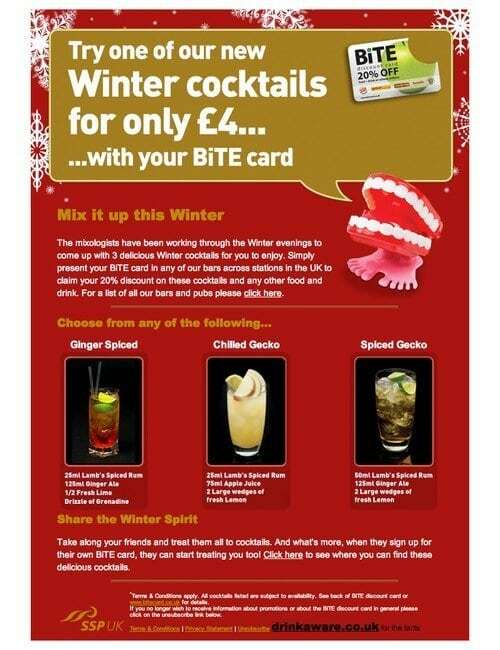 Bite Card‘s newsletter has festive background imagery to evoke the winter season. It is simple, with a big banner at the top showing the product price, followed by cocktail choices and ingredients. 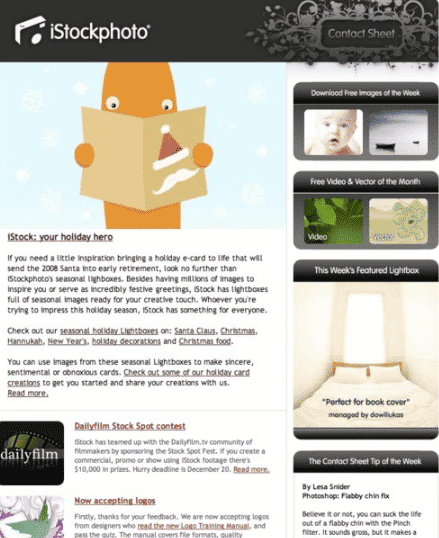 The Squawk‘s newsletter attracts users with the beautiful book cover on promotion for that month. Cauldron‘s newsletter also has a tidy layout and clearly defines the purpose of each section. It tells users the subject of its next issue in the “Coming Next Month” section at the bottom, a nice tease. Mango‘s newsletter makes good use of bright, attractive colors. iStockphoto‘s uses a gallery to present its top eight photos of the month: neat and easy to scan. Read more here about Sailthru’s Personalization Marketing Solutions and how they can help you grow and retain your customer base. This article is by Chui Chui Tan from smashingmagazine.com.